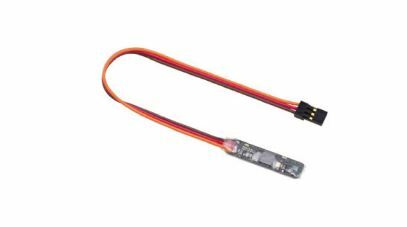 The new TLS1-VRO Variometer and Altimeter DMSS telemetry sensor allows pilots to accurately determine the altitude at which they are flying, as well as their rate of climb or descent. This is particularly helpful for sailplane pilots as it gives them two very powerful tools to aid in their search for thermals and to monitor flight performance. •Dual sensor combines the simultaneous function of a variometer and altimeter. •The high-precisions MEMS barometric pressure sensor is accurate from +0.1 m/s and + 2m. •Features the largest detection range of this type of sensor on the market; variometer range of +99.9 m/s and altimeter range of 0-9,000m. 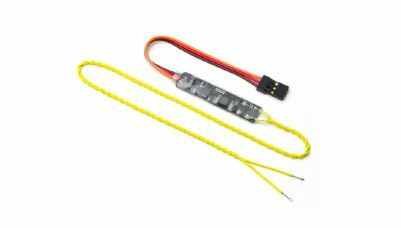 The TLS1-VOL Flight Pack Voltage DMSS telemetry sensor was designed to give pilots more information regarding their battery’s performance. Intended for use with large electric flight packs, the TLS1-VOL solders onto your pack’s connector to give an exact voltage reading, in real-time. The sensor is simple and easy to install, and can be used to monitor the vitals of a single cell or the voltage of the entire pack.